Sam and His Musket (1935). 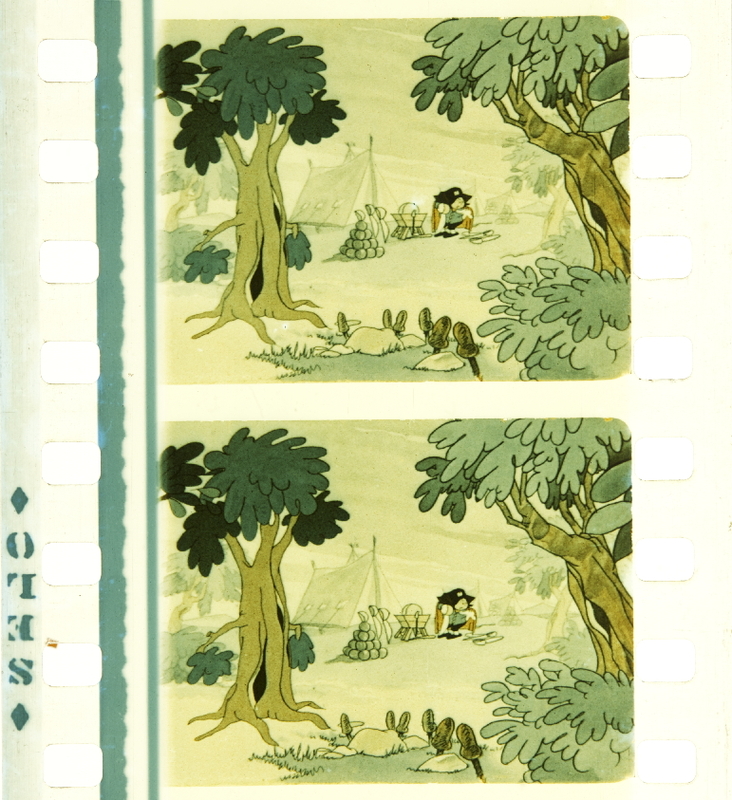 Anson-Dyer’s colour cartoon, produced by Anglia Films Ltd.
Credit: Courtesy of BFI National Archive. Photograph by Barbara Flueckiger. 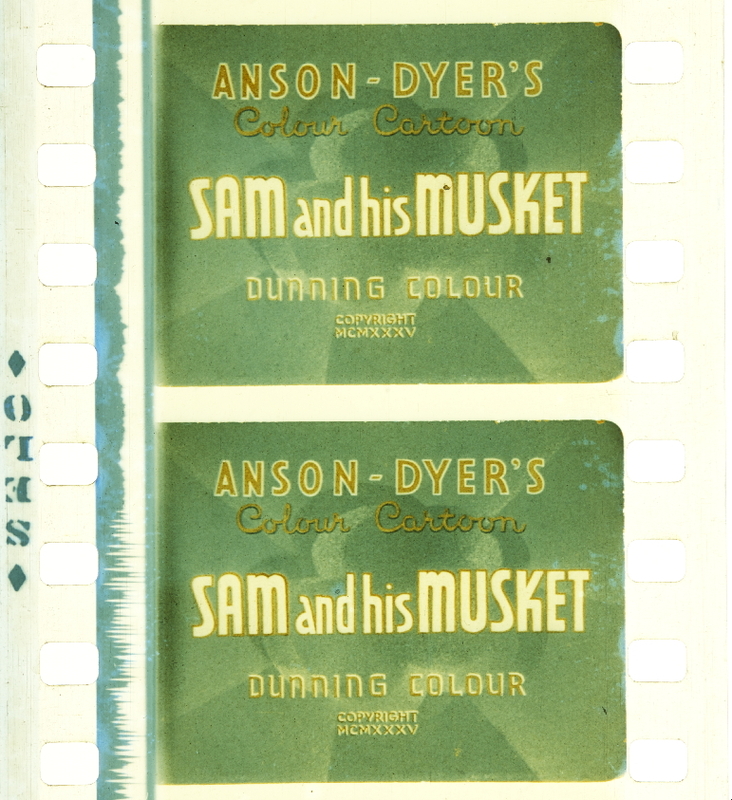 Film: Sam and His Musket (1935), Anson-Dyer’s colour cartoon, produced by Anglia Films Ltd.
“ADVERTISING. 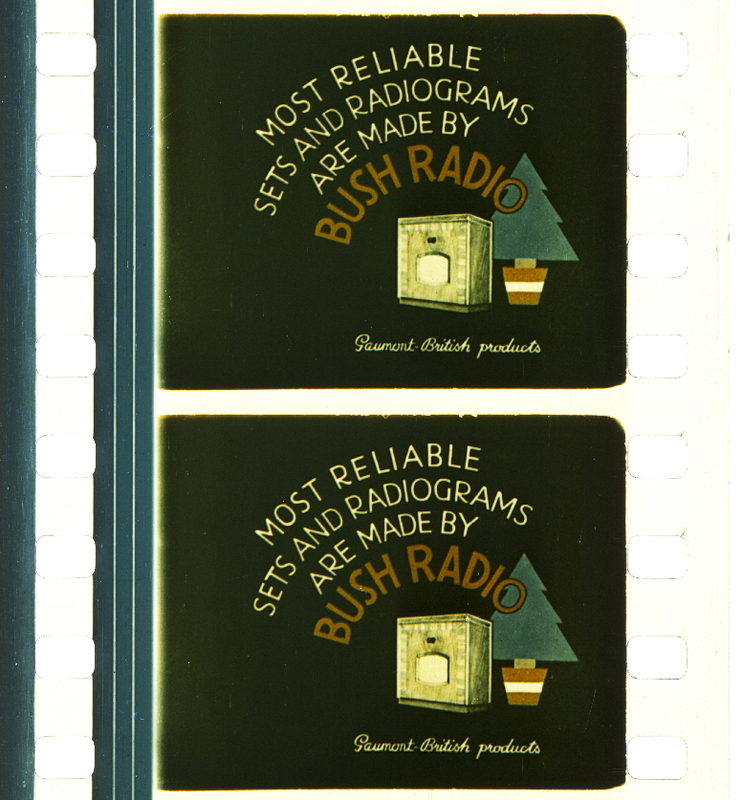 Animated advertising film for Bush radios, to the tune of “The Old Bull and Bush”. People walking to a fair on Hampstead Heath. Comic interludes from the fair; swings, coconut shy, snake charmer etc. A couple enter the “Old Bull and Bush Inn”. CU the sign inn, a bee stings the bull, which runs off; the bush springs to life and recommends Bush radios (272).” (NFA Catalogue). Credit: Courtesy of BFI National Archive. Photograph by Barbara Flueckiger. Credit: Courtesy of BFI National Archive. Photograph by Barbara Flueckiger. Film: All the Fun of the ‘air (1937). “Most of the people who talk optimistically about the “trend toward color” overlook one very important fact. That is that so far color production has been concentrated at the extreme ends of the production scale: short-subjects — cartoons, travelogues and novelties — at one end, and a handful of “super-special” features at the other end. In between these extremes lies the bulk of production — program features, Westerns, independent productions, “quickies” and the growing class of commercial and industrial films. Almost without exception, these have been made in black-and-white; until they begin to turn colorward, all this talk about “trends toward color” is wasted breath. There’s a reason for this condition. The short-subjects have to have color; the super-productions can afford to use intricate and expensive color-processes. But the vast field of in-between releases haven’t been able to find color they could use to commercial advantage: In general, really good color meant expense; economical color meant cheap, inferior results. I have just finished photographing two productions in a color process aimed squarely to fill this need. The process is “Dunningcolor,” and it is the creation of Carroll and Dodge Dunning. It gives remarkably good results. It is easy to photograph. It can be worked successfully under the hurried conditions of program and independent production. And it does not force the producer to gamble a six-figure sum for the luxury of color. In other words, it is practical, not only as a matter of photographic technique, but as a commercial proposition. In order to assure the greatest possible simplicity, the Dunningcolor process is at present a two-color method. But it has refined considerably beyond the general conception of a two-color process. The outstanding faults of most two-color systems have been eliminated, and the tonal range has been extended until it very closely approaches three-color results. The Dunning color process is emphatically not a bi-pack process, nor does it depend on such optical abominations as reduced-size images on a single film, multiple lenses, and the like. These ideas may have their individual good points, but they also have disadvantages that cannot be overlooked. In a conventional bi-pack, for instance, the back-negative image (the blue printer, which keys definition) is almost invariably slightly out of focus. Consequently, the resulting color-print is out of focus, or, to put it more correctly, lacks definition. At the same time, since two different emulsions are used, there is a considerable differential in contrast between the two negatives; no matter how the printings are juggled, this remains, and the result is that the resulting print loses in the neutral tones. In reduced-frame methods, this, at least, is corrected, but the problems of register, printing, and the like are disproportionately increased. The multiple-lens systems naturally run afoul of parallax, fringe and printing troubles. The Dunningcolor negatives are made in a specially-built Dunning camera, on two separate films, both standard Eastman Super-X Panchromatic. These films run side by side through a twin movement, and receive absolutely normal, full-frame-sized images. The lens is a standard type — a modified Bausch & Lomb Raytar — fitted with a special “Multichrome” optical unit devised by Hartley Harrison which divides the lens image in two, and filters each appropriately. At present, the lenses fitted include the standard 50mm, 75mm and 35mm lengths: The 35mm is a genuine 35, rather than a longer focal length fitted with a supplementary glass to widen the angle without supplying such other important characteristics of a true 35 as depth of field, etc. Since ample room exists between the lens-turret and aperture of the Dunning camera, it is probable that ultimately even a normal 24mm lens will be available — the first time such an objective has been available in a color camera. The camera itself is essentially similar to a silenced Bell & Howell movement, except that there are two films passing through two apertures placed side by side, and driven from a common shaft. The sprockets, pilot-pins, shuttles, etc., are naturally in duplicate. The magazine is of the standard type, but double width, to accommodate two 1,000-foot rolls of negative film side by side. The twin take-up is driven through a simple automatic clutch which allows each film to be taken up independently. Focusing is done in the usual manner, by means of a throw-over movement, a ground glass and a magnifying optical system. One of the most unique features of the camera is the color-control system which is built in. It allows the cameraman to balance up his filters — and consequently his color-cendition — for every shot. Looking through the focusing finder, the image his seen reproduced exactly as the filters and printing will recreate it. If the filter-balance is not right for the scene or the light, a simple twist of the filter-control dial will re-balance the system. For instance, suppose it is late in the day, and the light is growing pretty red. This can be seen on the ground glass: A simple twist of the dial, and the image cools down to normal — the whites change from yellow to white. Shooting the scene with this setting, the negatives and the final print capture exactly the effect seen in the finder. The same control can also be of value in overcorrecting for any desired color-effect, such as night-effects and the like. This control makes it easy to balance the camera for any type of lighting — sunlight, arcs or incandescents. On interiors, a cameraman can use incandesmately his normal lighting balance, but it is naturally necessary to increase the intensity of the light enough to offset the absorption of the filters and the beam-splitting optical system. Theoretically, this increase should be considerable; actually I have found it to average about 65%, which seems to be about the minimum for any successful color work. The two negatives are developed quite normally, in any good black-and-white laboratory. 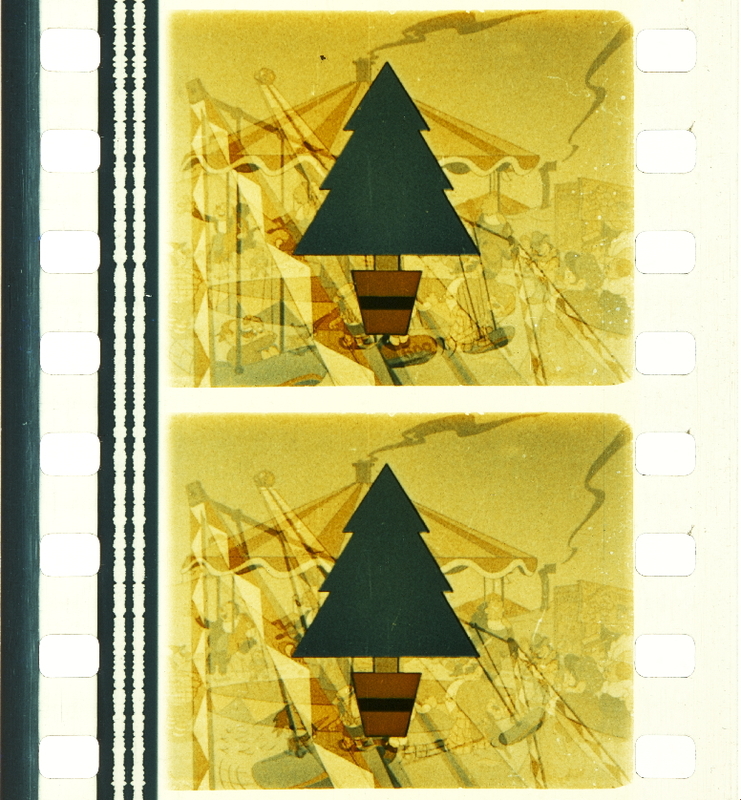 The color-prints are made on standard Eastman positive film: On standard black-and-white single-coated stock, not on duplitized (double-coated) film. This is done by a special process in which the two color-images are literally intermingled. The two negatives are both perfectly sharp. Their respective prints are not only sharp, but both lie in the same plane. Consequently, the resulting color picture is critically sharp on the screen. So much for the technicalities of the process. How about the dollars-and-cents angle: is it still a polite Jesse James proposition? In the first place, the actual shooting costs scarcely more than black-and-white. The costs of film, cameras and cameramen are pegged closely to established black-and-white standards; of course, where in black-and-white the camera would be loaded with one thousand-foot roll, in this it must be loaded with two. But the differential is negligible when compared to the cost of any production. It would be a misstatement to say the cost of shooting Dunningcolor was identical with that of monochrome, but it is as nearly so as any color has yet come. Up to this point, the producer has paid a bit extra for color, but he has not lost his established black-and- white value, for he has a perfectly commercial black-and-white picture. The rushes are printed in black-and-white, from the red-filter negative. This gives a print that look about like standard black-and- white shot through a filter a little lighter than a 23-A. This correction is a shade heavier than normal, but not enough overcorrected to distort skin tones, and the like. Now if the producer doesn’t want to gamble with color, he doesn’t have to. He can make perfectly commercial black-and-white prints from this negative and release them. If, on the other hand, he wants to try color, he can have the blue-filter negative cut, and make as many color prints as he wants; he can issue all of his releases in color, or part in color and part in black-and-white. He can make his domestic release in color, and his foreign release in black-and-white. Or, through the George Humphries Laboratory in England, which is affiliated with Dunning, he can make all or part of his foreign release in color. The same idea, too, works for the foreign producer, who can use a Dunning camera from the Humphries plant, with identical color-printing abroad or in Hollywood. From this viewpoint, the process certainly seems practical; but what appeals even more strongly to me, as a practical cameraman, is the way it stands up under actual production. There’s no useless mummery about it. The first Dunningcolor picture I photographed — a four-reel feature for the California State Highway Department — was made under conditions that would keep a black-and-white unit plenty busy. We covered 11,000 miles on the state highway system, never getting farther from the road than our battery-cables could stretch. We shuttled up and down and across the state at high speed, on a schedule as closely figured as that of a limited train. We had no time to play around with the mysteries of color: We get our scene the first take or not at all. And we came back with a real picture! “Camera. — A new beam-splitter is employed, the gates being side by side. A super-pan negative and a bipack are exposed through graduated filters, which are adjustable in order to compensate for different lighting conditions — daylight, incandescents, or arcs. Printing. — Standard double-coated positive stock is used, the red and blue images on one side, and the yellow on the other. 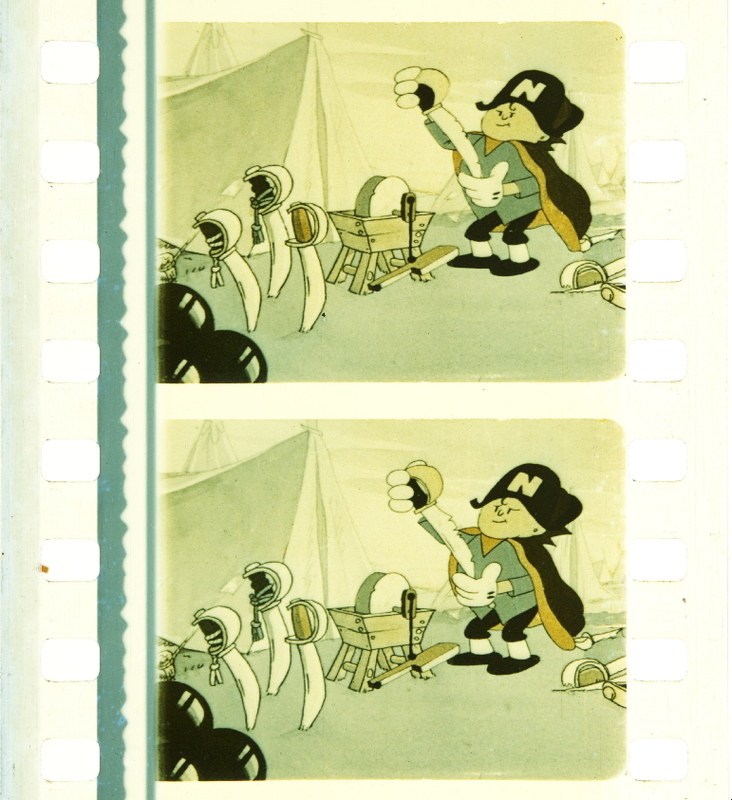 “A process for duplicating 16mm Kodachrome films for the commercial studios, Dunningcolor has been limited mostly to cartoon films and to a South American travelog called Tehuantepec.112 Carroll H. Dunning and his son, Dodge, perfected the system in 1937. Two colors are obtained photographically and the third, yellow, is applied by a gelatin matrix.112 It is processed by the Eastman Kodak Company. 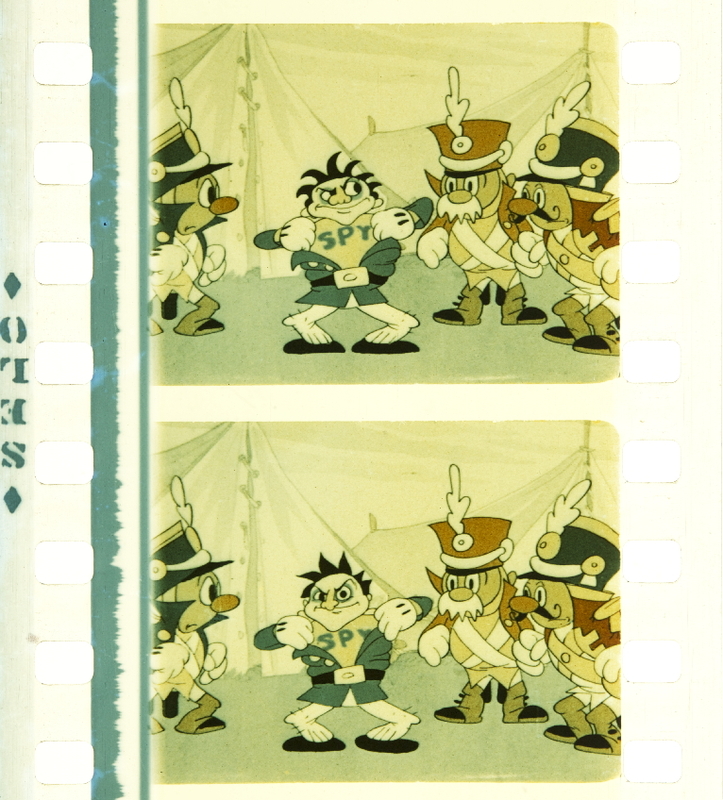 Mr. Dunning was associated with The Glorious Adventure, one of the first color films to be produced in the Prizma process. 112 Letter from Dunningcolor Corporation, July 7, 1952. 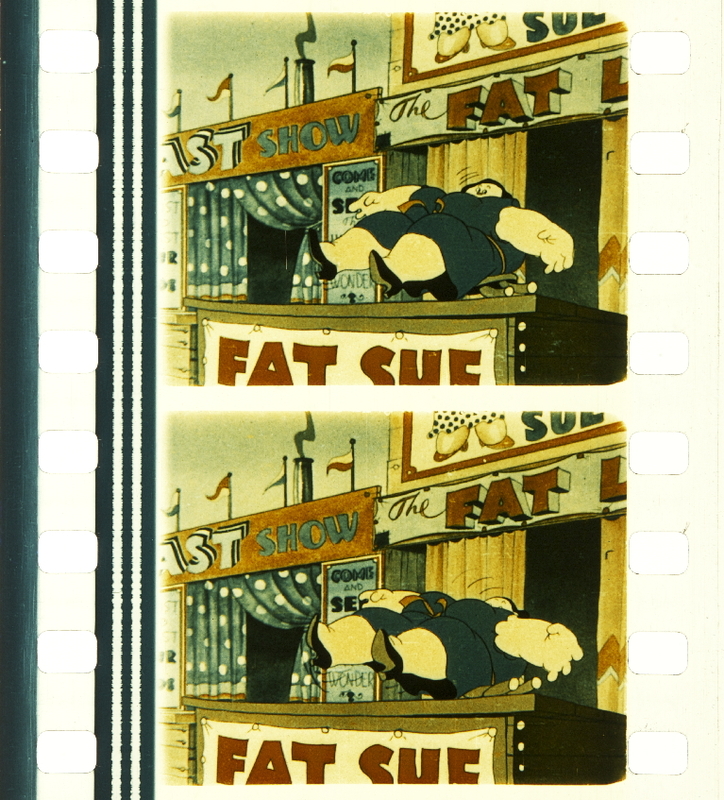 In addition to this system for 35 mm release prints the Dunning Color Laboratory also produced three-color subtractive 16 mm color prints on Kodachrome duplicating film (Kodachrome Duplicating Film, Type 5265), which were processed by the Eastman Kodak Co.
Dunningcolor was developed in the 1930s by American Caroll H. Dunning, who also invented the Dunning process for travelling matte photography, used most famously in the original King Kong (1933). Dunning also collaborated with William Van Doren Kelley on the short-lived Kesdacolor process. Originally, Dunningcolor was a two-colour process using a specially built camera in which two separate panchromatic negatives ran side by side. The light from the source was split through two filters, with the red record registered on one film and the green on the other. An average of 65 per cent more light was needed and the camera had a built-in control system allowing for the cameraman to make adjustments depending upon the light source. Colour prints were made on duplitised stock. Rushes from the red record could be printed in black and white and were suitable for release. 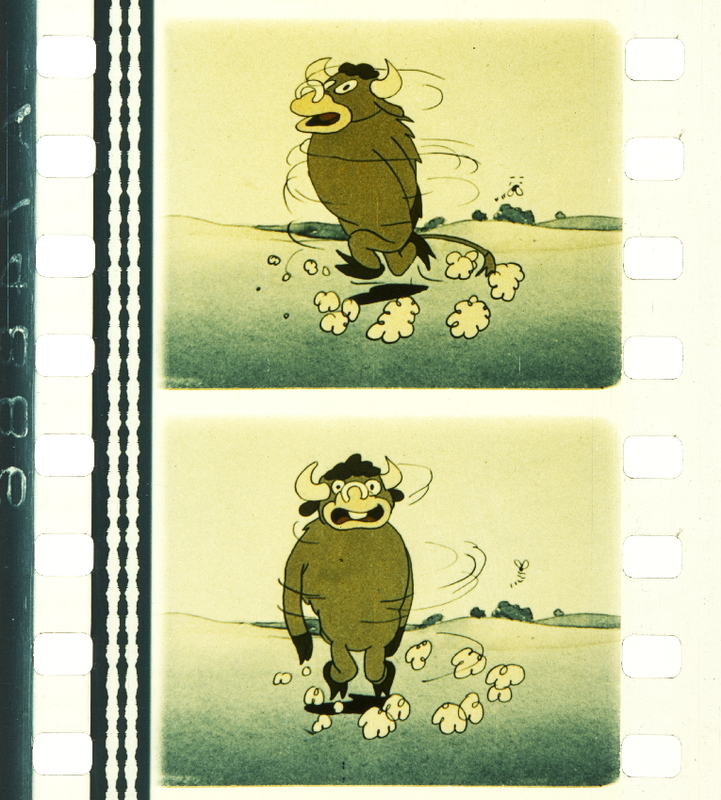 Rarely used for live action, Dunningcolor achieved modest success in the field of animated shorts, and in particular was adopted by the English animator Anson Dyer who, having set up his own animation studio in 1935, used Dunningcolor for many of his most popular films between 1935 and 1937. 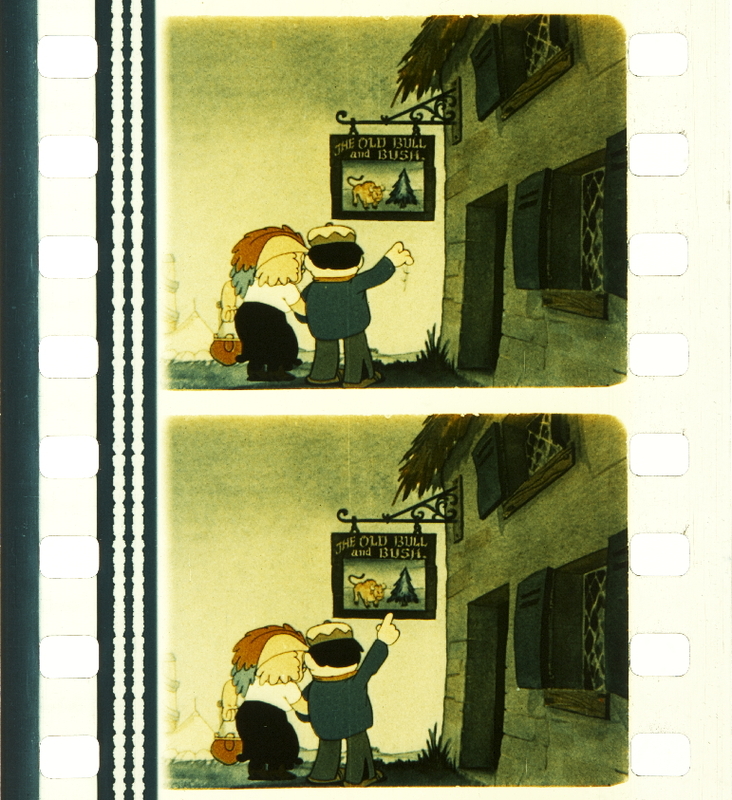 Dunningcolor was altered to a three-colour process in 1937. In the three-colour version, a beam splitter was used in the camera to split the image though two gates, positioned side by side. Through one was a panchromatic negative, through the other a bipack negative. Prints were made on duplitised positive film from three separation negatives. The red record negative was printed on one side and dyed cyan, while the green record was printed on the other and dyed magenta. Yellow was added by imbibition from a matrix printed from the blue record negative. In July 1939 Dunning announced that the three-colour process was ready for commercial use. 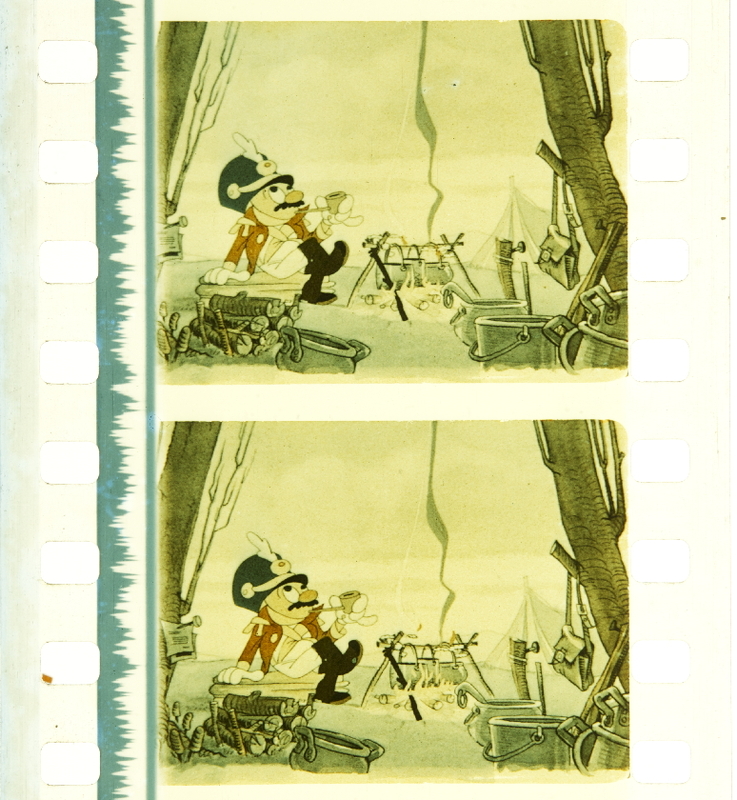 It was estimated tire cost for Dunningcolor films would be about twice that of normal monochrome prints. In Britain it was expected that George Humphries would process Dunningcolor films, as Humphries labs were already capable of handling 10 million feet of two-colour Dunningcolor per year and just needed new equipment to handle the addition of a third colour. Almost immediately afterwards, Dunningcolor faded away. Why the process never achieved commercial exploitation is unknown, but the most likely scenario is that the outbreak of World War II prevented any further development. Film stock became scarcer and the market more problematic as imports and exports were affected by the war at sea, the government tightened control over factory production and technicians and staff went off to fight. The exact manner in which this affected Dunningcolor is yet to be determined, but it was never commercially exploited in Britain after 1939. Cornweil-Clyne, Adrian, Colour Cinematography (London: Chapman & Hall, 3rd edn, 1951), p. 418. The Commercial Film, May-June 1936, p. 6. Kinematograph Weekly, 3 December 1936, p. 308. Ryan, Roderick T., A History of Motion Picture Colour Technology (New York: Focal Press, 1977), p. 106.